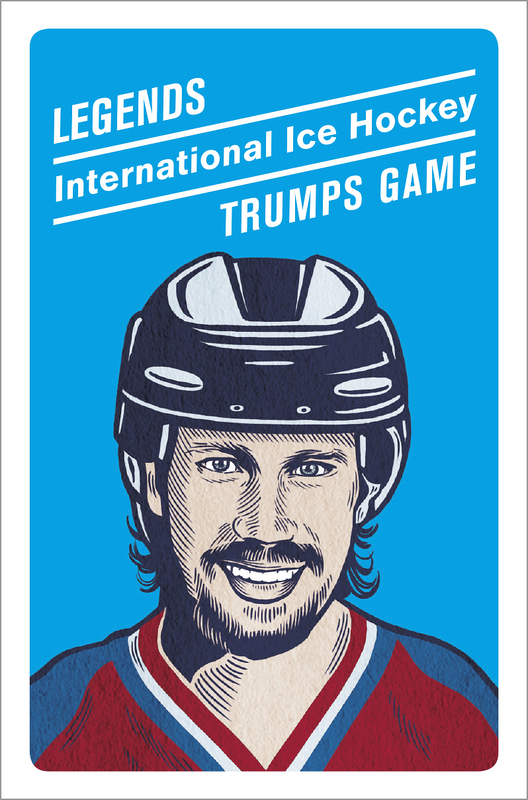 If you enjoy card games like “Trumps” — where the highest card wins — or “Go Fish,” but wish they somehow involved hockey, then you should check out Legends International Ice Hockey Trumps Game. 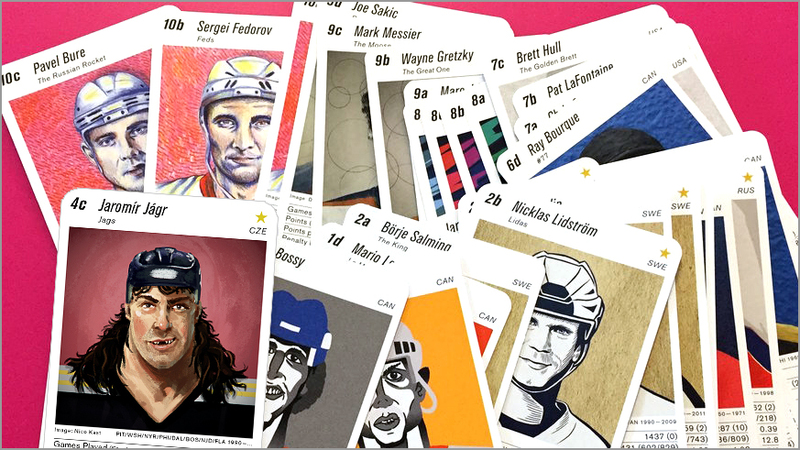 It is a new card game from Switzerland that features 40 eye-catching illustrations of the best hockey players from around the world. Sold as a full deck online, Legends Trumps Game shows your favorite Hall of Fame players like you’ve never seen them before. Each deck has 40 player cards and one instructions card. Naturally, all of the obvious names are here, like Wayne Gretzky, Mario Lemieux, Gordie Howe and Bobby Orr. 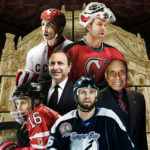 Legends Trumps Game includes players from all over the map — Canada, USA, Sweden, Finland, Russia, Czech Republic and Slovakia — so there are many international stars too. 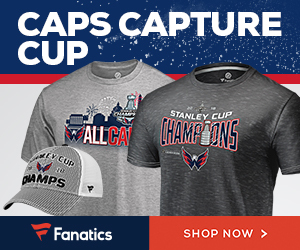 Only two current players are included — Jaromir Jagr and Alexander Ovechkin — which seems kind of odd, considering that those two are not in the Hall of Fame yet (but will be when they retire). The rest of the players found in this set are retired and in the Hall of Fame. 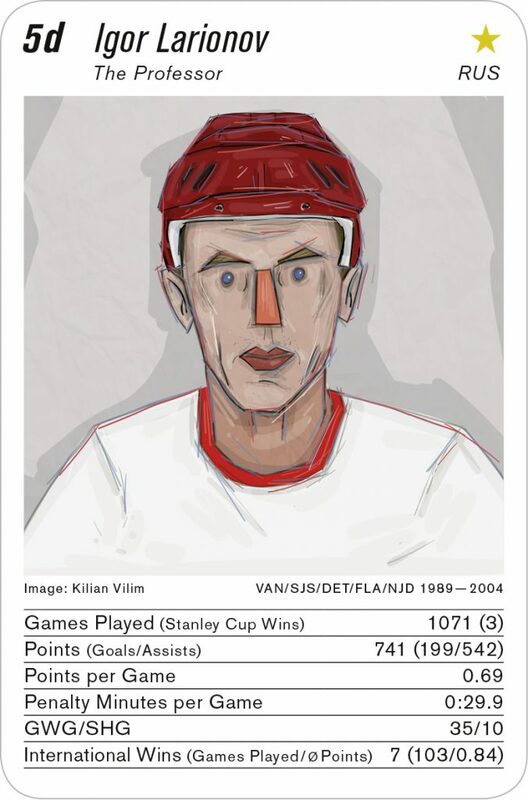 Most of the card’s front is filled with an original illustration of the player, created by one of ten European artists. 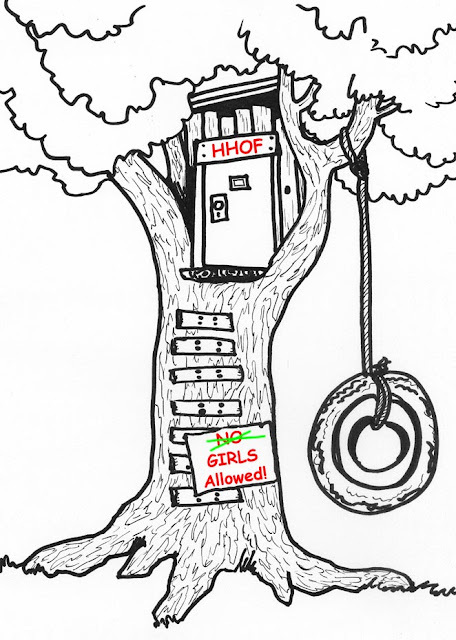 (The artists are credited under the picture, which is a thoughtful thing to do.) The bottom of the card displays career totals for different stats — more on that in a bit. Really, though, the player pictures are what makes this card game unique. Some of the artists used a more realistic approach, while others went a bit abstract — or even absurd — with their renderings. 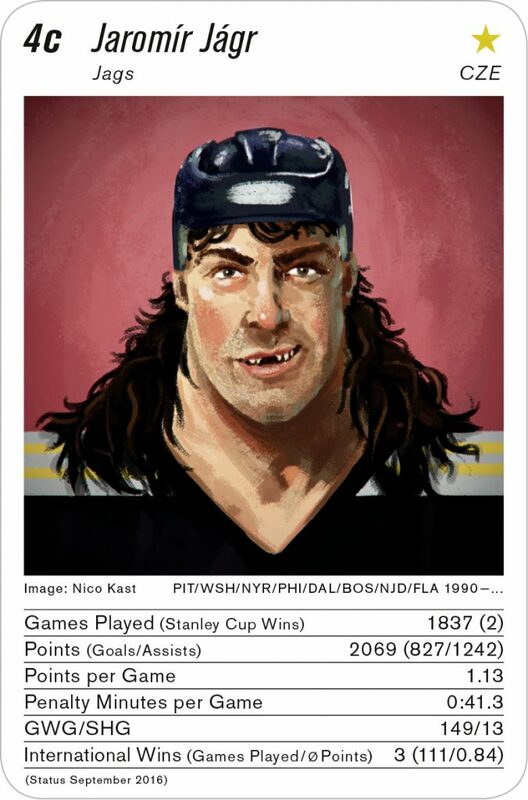 This illustration of Jaromir Jagr is hands-down my favorite. The broad shoulders, square jaw and overall superhero-ish appearance reminds me of the work of artist Simon Bisley, who illustrated the “Judge Dredd” and “Lobo” comics in the 1990s. Man, Esa Tikkanen sure looks looks evil. 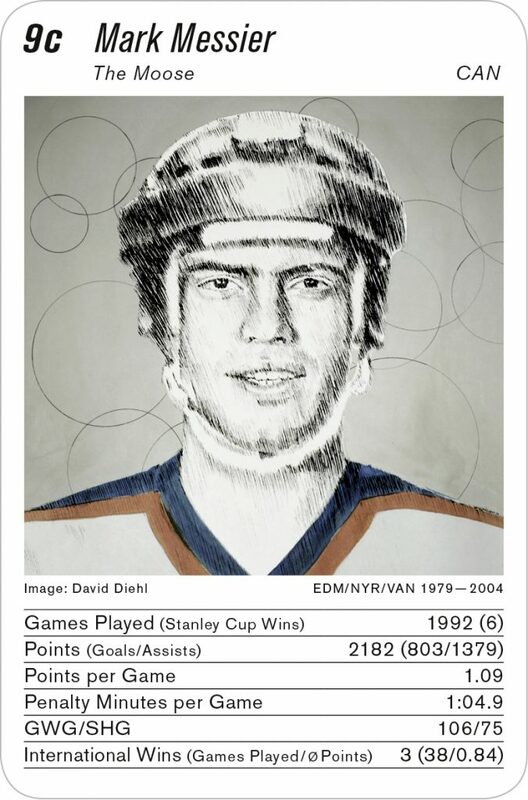 I wonder if the artist of his portrait is a Calgary Flames or New Jersey Devils fan. 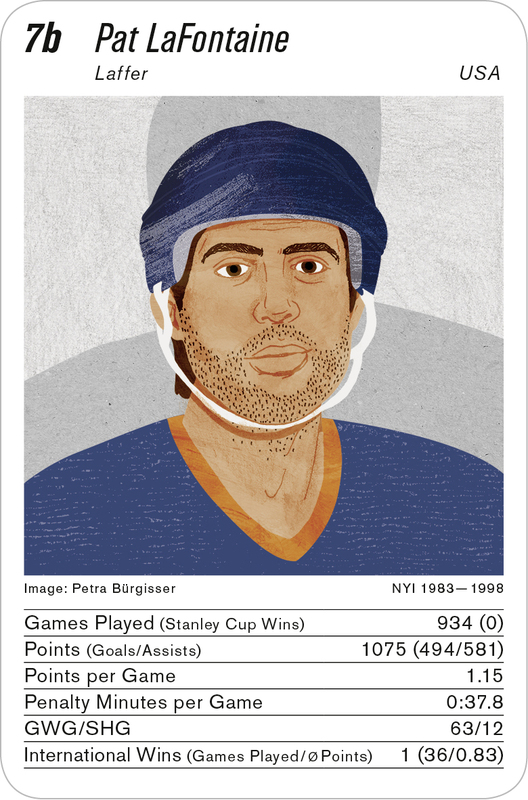 Under the player’s picture, each card lists out the following career totals: games played, number of Stanley Cup championship wins, points, goals, assists, points per game, penalty minutes per game, game winning goals, shorthanded goals, international tournament wins, international games played and international points per game. These various stat totals factor into game play. 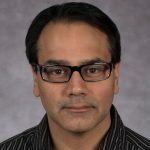 The inclusion of international stats is a nice touch, as those usually tend to be overlooked in favor of NHL stats and Stanley Cup victories by North Americans. 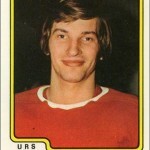 Some of the players in this set, particularly the Russians, had stellar international careers. 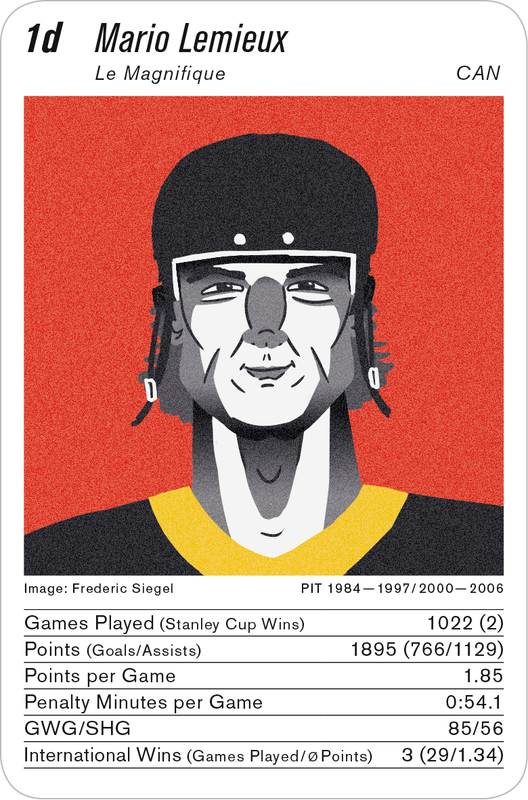 For the active players (Jagr and Ovechkin), stats are current up to September 2016. 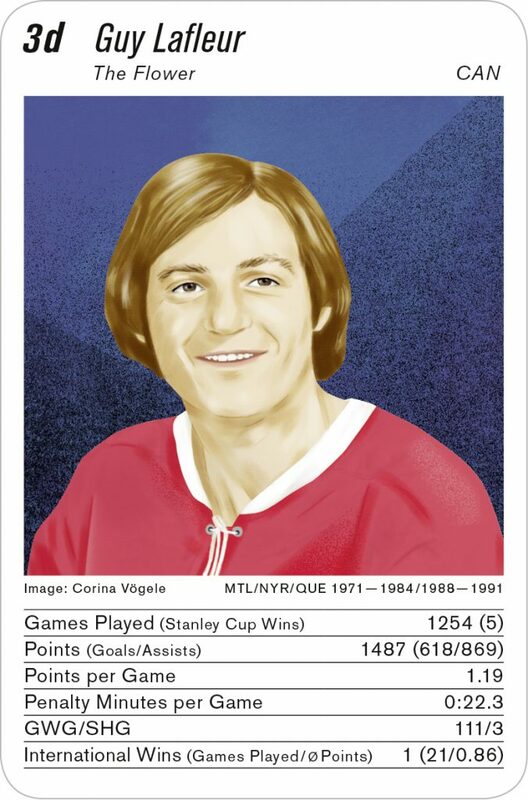 While these cards may not have the same amount of stats as typical hockey cards — and in all fairness, this really isn’t a set of trading cards — there is enough information here to learn about each player’s body of work. 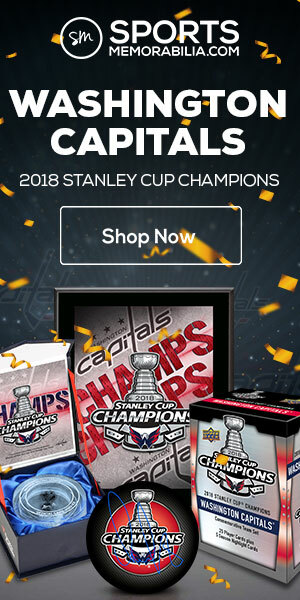 Since these are playing cards, all the backs have the same design: blue with white line art hockey icons of various equipment, the Stanley Cup and an Olympic medal. This is way better than those naked angels on bicycles that have adorned the backs of playing cards since 1887. The artwork may be cool to look at, but these cards are meant to be played with. A rules card details two different games. The first is a “trumps” game, where the highest or lowest value of a given statistic wins a hand. 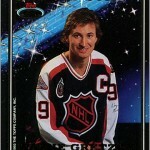 That would make Wayne Gretzky the “Ace of Spades” in many situations — the best card to have if “highest NHL point total” or “lowest penalty minutes” is called. The other game is known as “quartets” — spelled “quartetts” with an extra “t” in Europe — and is basically “Go Fish,” where you try to get four of a kind. Only here, you are trying to get four players from the same country. Got any Finns? Go Fish! A deck of Legends Trumps Game has 40 player cards and one instructions/rules card. The deck comes boxed. Cards measure 2-5/8″ by 4″, have rounded corners and are about the same thickness as traditional playing cards. Although slightly larger than standard trading or playing cards, these will fit nicely in eight-pocket pages. The game can be purchased at the Legends Trumps Game website for $16 U.S., $21 CDN or €15 (prices include shipping). That’s not bad, considering that this game is made by a small company and not mass produced in the same quantities as, say, Uno or Apples to Apples. If you like card games or offbeat items, you might want to pick up a Legends Trumps Game deck. The artwork on the cards is creative. 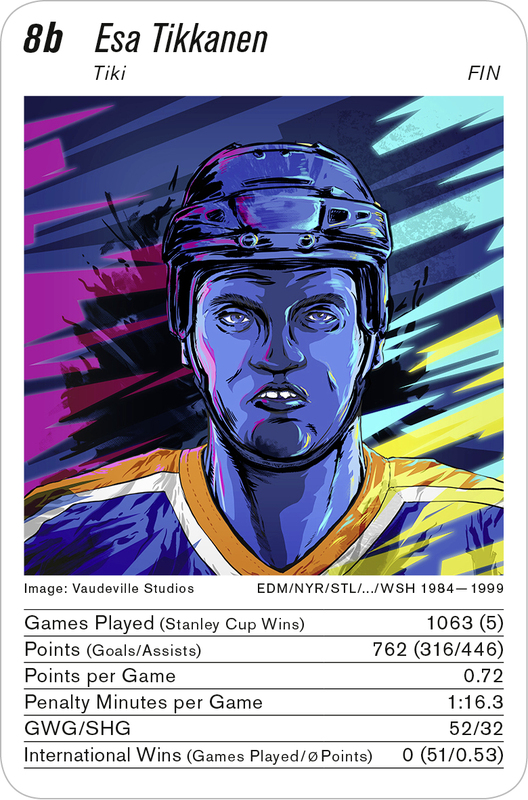 Not all of the portraits appeal to me (some are just too weird) but this deck of hockey cards succeeds at bringing hockey fans something different. TREMENDOUS REVIEW OF THIS NEW ITEM … WELL DONE, THANKS … HOWEVER, AS A LONG TIME COLLECTOR, AM WONDERING HOW MANY WOULD BE INTRIGUED BY THE ODDBALL AND SOMEWHAT WEIRDO ILLUSTRATIONS AS JUST THOSE YOU SHOW ARE RATHER STRANGE … PRICE DOES NOT SEEM TOO HIGH BASED ON WHAT ALL ELSE SELLS FOR THESE DAYS … NOT BEING A ‘ GAMES ‘ PLAYER THAT ANGLE WOULD NOT APPEAL TO ME IN PARTICULAR, THOUGH … WOULD BE RATHER INTERESTING TO SPEAK WITH PLAYERS DEPICTED TO KNOW WHAT THEY THINK OF THEIR OWN CARD AS LAFLEUR LOOKS AS HE DOES BUT A FEW MIGHT BE SOMEWHAT OFFENDED, SUCH AS JAGR AND LaFONTAINE, TO DOWNRIGHT ANNOYED AND THAT MAY THEN MAKE IT TOUGH FOR THOSE WHO WANT TO HAVE THESE SIGNED. Error found! 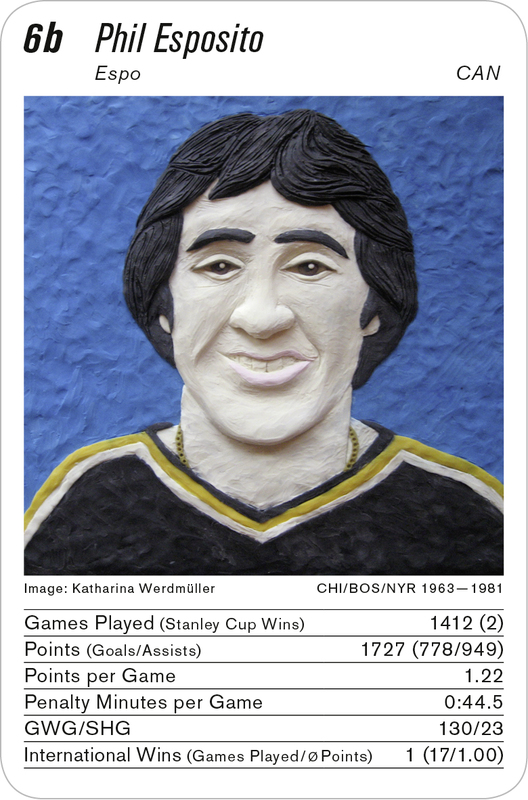 The LaFontaine card lists his team as “NYI 1983-1998”, but he also played for the Sabres and Rangers during that time period. Great find! Would be really interesting to know: does this small company actually have license to use these images for a sales product? 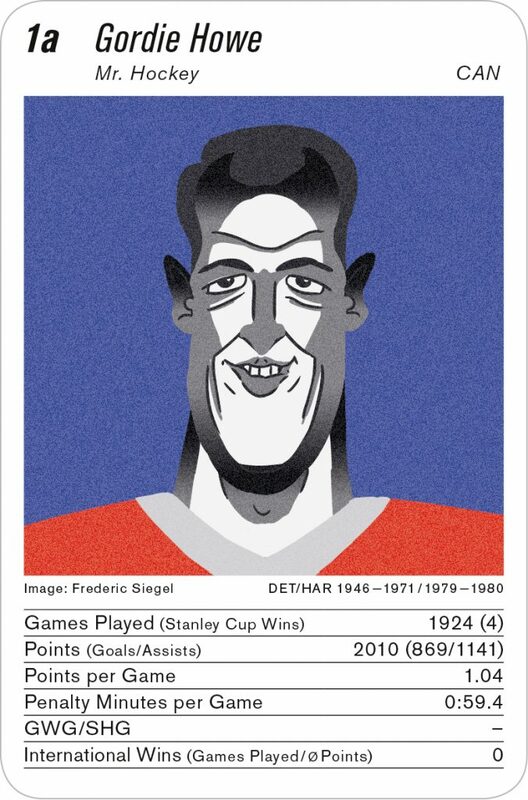 Obviously these are not NHL endorsed, but doesn’t the company need to go through them to depict players this way? 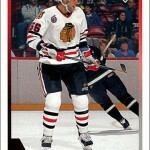 I’m pretty sure the NHL has extensive license agreements with card makers.